Dr. Ryan Gardiner grew up in southern California and fell in love with outdoor activities through camping and scouting as a kid. He has always found great fulfillment in helping others. 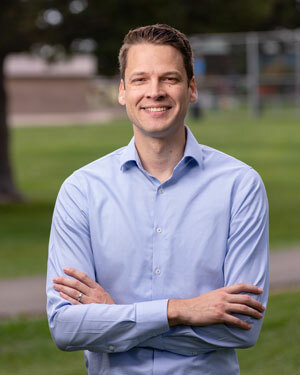 While earning his Bachelor of Science degree in Psychology at Brigham Young University (BYU), he worked for four years at a home for men with special needs. During this time he began shadowing a variety of health care providers including an orthodontist. He loved the idea of empowering a person with confidence both through a beautiful smile as well as through a caring relationship. He pursued this path at the University of Nevada, Las Vegas where he graduated with honors and earned his Doctorate in Dental Medicine. He then went on to receive orthodontic specialty training and a Master’s of Science in Dentistry degree from the Orthodontics and Dentofacial Orthopedics program at Louisiana State University. Dr. Gardiner is an active member of the American Association of Orthodontists, the American Dental Association and all of their constituent societies. He loves orthodontics and treats every patient the way he would treat a member of his own family. Fun facts about Dr. Gardiner: Dr. Gardiner knows Spanish and lived for two years in Chile. He has been married to his wonderful wife, Stephanie for nine years. They have two boys - Luke (4) and Levi (2). He enjoys cheesy dad jokes, please share one with him! He loves tennis, reading, fishing, learning new things, cars, and snowboarding, but his favorite thing is playing with his two boys. We are delighted to welcome Dr. Gardiner to the practice and to our community.